The slc26a6(E613) residue plays a major role in slc26a6 activity as well as in the interaction with and in the regulation of NaDC-1. (A) CoIP of WT hNaDC-1, WT mSlc26a6 (A6), and mSlc26a6(E613A). (B) Summary and representative traces of hNaDC-1–dependent Na+ succinate current in Xenopus oocytes expressing hNaDC-1, either alone (black), with WT mSlc26a6 (light gray), or with mSlc26a6(E613A) (dark gray) (two oocyte batches). Summary and representative traces of the (C) current and (D) changes in intracellular Cl− mediated by mSlc26a6 and the indicated mutant in Xenopus oocytes (two oocyte batches). *P<0.05, **P<0.005. The NaDC-1(K107A) mutation affects the interaction with slc26a6 and succinate transport. (A) CoIP of WT hNaDC-1, WT mSlc26a6 (A6), and hNaDC-1(K107A). 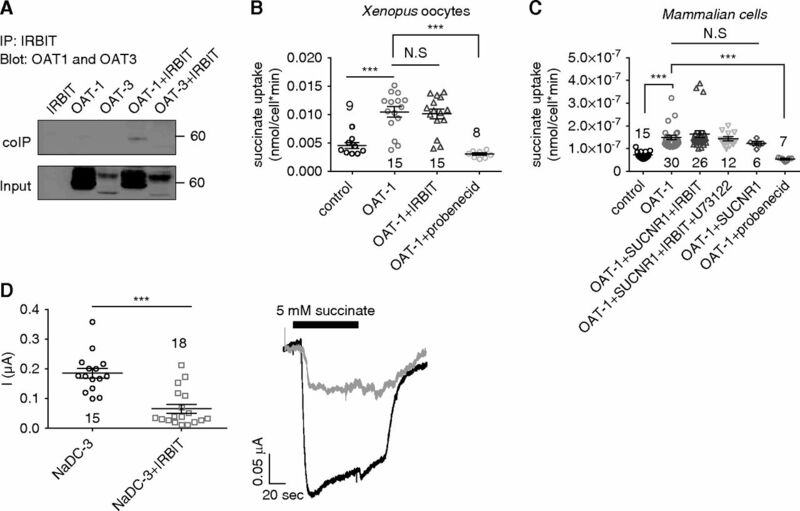 (B) Summary and representative traces of the current mediated by hNaDC-1–dependent Na+ succinate cotransport in Xenopus oocytes expressing hNaDC-1 alone, and hNaDC-1(K107A) either alone or in the presence of mSlc26a6, as indicated (three oocyte batches). *P<0.005. 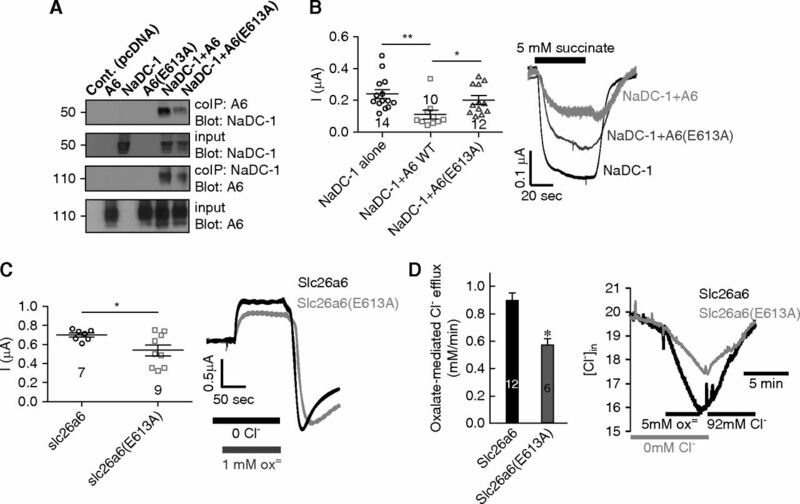 Succinate signaling pathway regulates the interaction between NaDC-1 and IRBIT and the NaDC-1–mediated succinate influx. (A) Changes in [Ca2+]i were monitored in HEK293T cells transfected with hSUCNR1 (black) or an empty vector (gray, control) and stimulated with 5 mM succinate in a Ca2+-free solution. (B) CoIP analysis of HEK293T cells transfected with hNaDC-1, IRBIT (IRB), and/or hSUCNR1 and treated with 1 mM succinate for 10 minutes before lysis. (C) Currents mediated by NaDC-1–dependent Na+ succinate cotransport in Xenopus oocytes expressing hNaDC-1, IRBIT (IRB) and mSlc26a6 (A6), as indicated (five oocyte batches). *P<0.05. 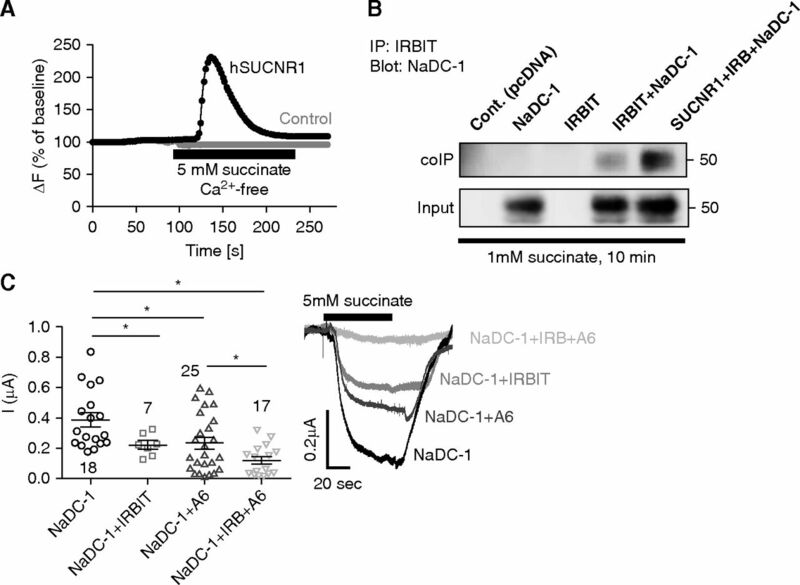 IRBIT regulates NaDC-3–, but not OAT-mediated succinate transport. (A) Lack of CoIP of mOAT-1 and mOAT-3 with IRBIT. 14C succinate uptake, measured in either (B) Xenopus oocytes or (C) HEK293T cells expressing different combinations as indicated (mOAT-1, hSUCNR1, and IRBIT or treated with the PLC inhibitor U73122 or the OAT inhibitor probenecid). Either water-injected oocytes or pcDNA-transfected cells were used as control. (D) Summary and representative traces of mNaDC-3–dependent Na+ succinate cotransport in Xenopus oocytes expressing mNaDC-3, either alone (black) or with IRBIT (gray) (three oocyte batches). ***P<0.001. Deletion of slc26a6 in mice reduces urinary succinate, elevates serum succinate and plasma renin, and increases systolic BP. (A) Urinary succinate concentration is significantly lower, (B) urinary creatinine levels are not significantly different (each data point is a single urine sample), and (C) serum succinate and (D) plasma renin are higher in slc26a6−/− mice, as compared with their WT littermates. (E) Renal expression of SUCNR1 monitored using Western blot densitometry in five WT mice, five slc26a6−/− mice, and four WT mice injected with 10 mg/kg body wt of succinic acid. *P<0.05, ***P<0.001. 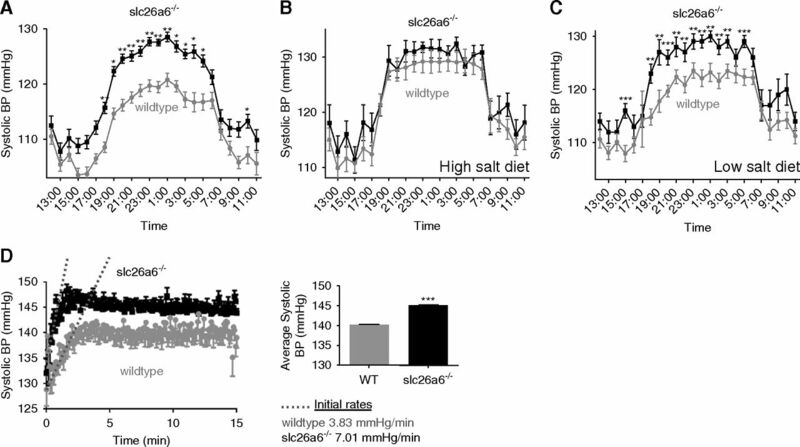 slc26a6−/− mice develop NaCl-independent hypertension during activity. (A) BP measured by telemetry is higher in slc26a6−/− mice during activity hours, as compared with their WT littermates (six mice in each group, an average of 5 days). BP was further monitored in the same mice fed with either (B) high- or (C) low-salt diets. BP in mice fed a high-salt diet was the same in WT and slc26a6−/− mice, and a low-salt diet had no further effect. (D) BP was monitored in slc26a6−/− mice and their WT littermates during mild physical stress. The inset shows the average systolic BP at the steady state (four to five mice in each group, an average of 3 days). *P<0.05, **P<0.005, ***P<0.001. 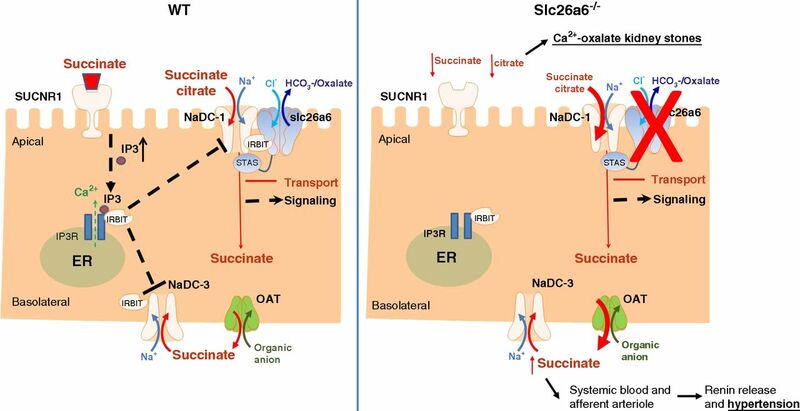 Schematic representation of the proposed putative mechanisms that regulate transepithelial succinate/citrate absorption. An apical succinate absorption is mediated by the NaDC-1–slc26a6 succinate transport complex. Concomitantly, luminal succinate stimulates the succinate receptor SUCNR1, which induces Ca2+ and IRBIT release by activating the intracellular IP3 receptor. Subsequently, IRBIT translocates to the membrane and binds to succinate transport proteins on both the apical and basolateral membranes, thus coordinating and modulating transepithelial succinate absorption. 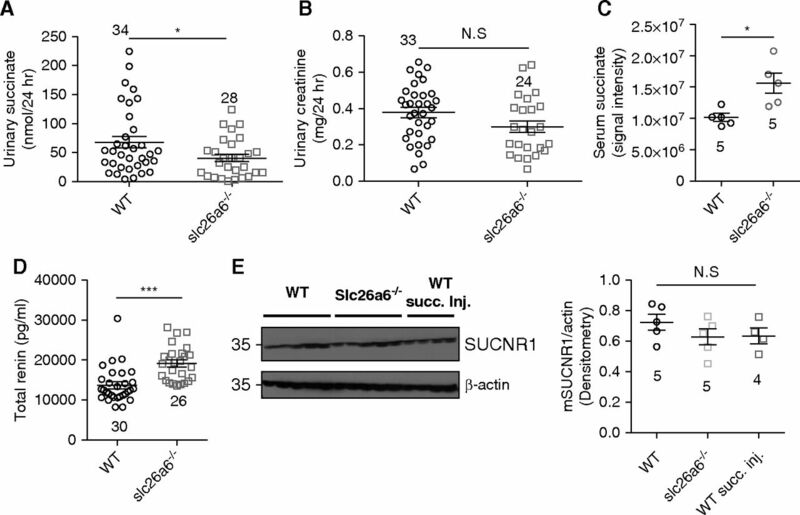 A deletion of slc26a6 results in elevated net transcellular succinate uptake, hyposuccinaturia, hypersuccinatemia, and increased renin secretion.